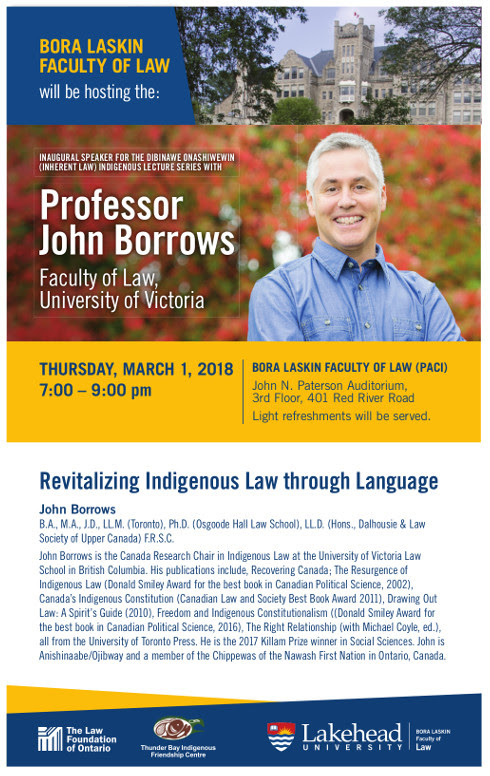 Lakehead University’s Bora Laskin Faculty of Law is hosting a lecture by John Borrows, Canada Research Chair in Indigenous Law at the University of Victoria Law School in British Columbia. Called Revitalizing Indigenous Law through Language, the free lecture will be held on Thursday, March 1 from 7 to 9 pm in the John N. Paterson Auditorium, third floor, PACI. Borrows has published Recovering Canada; The Resurgence of Indigenous Law (which earned him the Donald Smiley Award for the best book in Canadian Political Science, 2002), Canada's Indigenous Constitution (Canadian Law and Society Best Book Award 2011), Drawing Out Law: A Spirit's Guide (2010), Freedom and Indigenous Constitutionalism (Donald Smiley Award for the best book in Canadian Political Science, 2016), The Right Relationship (with Michael Coyle, ed. ), all from the University of Toronto Press. He is the 2017 Killam Prize winner in Social Sciences. John is Anishinaabe/Ojibway and a member of the Chippewas of the Nawash First Nation in Ontario, Canada.